What causes the bright line of reflected light that moves under the surface of a chatoyant gem? Cat's-Eye Chrysoberyl: Chrysoberyl is the gem that exhibits the finest "cat's-eye." 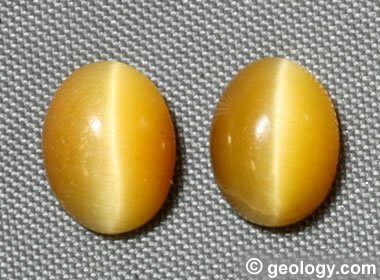 When the name "cat's-eye" is used alone, it is understood that the speaker is referring to a cat's-eye chrysoberyl. When the speaker is referring to any other gem with a cat's-eye, the name of that gem is used after the words "cat's-eye." For example: "cat's-eye apatite." This green cat's-eye chrysoberyl was produced in Sri Lanka and is about 5.6 x 4 millimeters in size. Chatoyance is an optical phenomenon in which a band of reflected light, known as a "cat's-eye," moves just beneath the surface of a cabochon-cut gemstone. Chrysoberyl and tiger's-eye are two of the best-known gem materials that exhibit this phenomenon. Excellent specimens of chrysoberyl exhibit the finest chatoyance, and tiger's-eye is the chatoyant gem most widely used in jewelry. Chatoyance occurs in stones that contain a large number of very thin parallel inclusions within the stone, known as a "silk." The light reflects from these inclusions to form a thin band across the surface of the stone. The band of light always occurs at right angles to the length of the parallel inclusions. These inclusions can be crystals, hollow tubes, or other linear structures that are present throughout the stone and are usually aligned with a crystallographic axis. Needle-like crystals of rutile and hematite are well-known for producing a cat’s-eye in many specimens. Tiger's-Eye Cabochons: Two "honey" tiger's-eye cabochons with very nice chatoyance. These stones are 8 x 6 millimeter ovals and cost a few dollars each. They were cut from material mined in the Central African Republic. Tiger's-eye is the only chatoyant stone that is produced in large quantities in calibrated sizes. That makes it the only chatoyant stone commonly seen in mass-production jewelry stores. It is very popular in men's rings and cufflinks. The name "chatoyance" originates from the French word "chatoyer," which means "to shine like a cat's eye." The analogy also matches the way a cat's pupils will narrow to a thin slit under bright light. 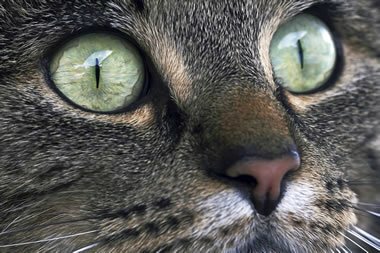 Cat's Eye with a Slit Pupil: This cat's eyes have responded to bright light by closing their pupils to a narrow slit. This is where the "cat's-eye" gemstone name originates. Image copyright iStockphoto and Astrid Gast. 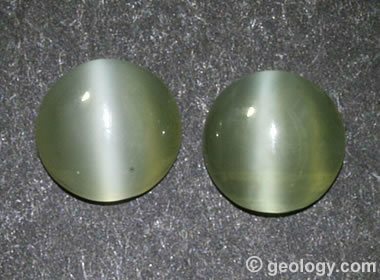 Cat's-Eye Actinolite: Two cat's-eye actinolite cabochons cut from material mined in Tanzania. Actinolite is an amphibole mineral that often has a fibrous internal texture that serves as a "silk" and produces very strong eyes. These stones are 7-millimeter rounds. A good analogy for the chatoyance effect is how light reflects to form a line across the surface of a spool of silk thread. Viewing and moving a spool of silk thread under a beam of incident light can be a useful way to develop an understanding of how parallel inclusions produce an "eye" within a gemstone. Cat's-Eye on Silk Thread: These spools of silk thread exhibit chatoyance. 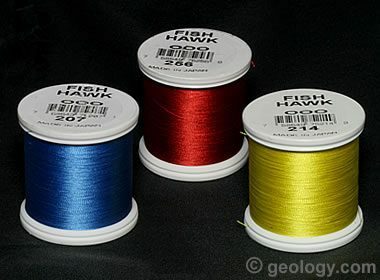 Light shining on the spools reflects from the lustrous silk threads. As a result, a line of light similar to the "eye" of a gemstone forms across the portion of the spool where the tangent of the spool's surface is at a right angle to the observer's line of sight. In a chatoyant gemstone, the band of light will move back and forth beneath the surface of the gem as it is turned under a beam of incident light. The band will also move if the position of the light is moved, or the observer moves his head to view the stone from a different angle. The motion of the cat’s-eye across the top of the gem is one of the things that makes these stones so interesting, beautiful, and desired by many people. Cat's-Eye Apatite: Apatite is a mineral that often produces a very nice cat's-eye on a gemmy base color. The golden-green cabochon on the left was cut from material mined in Kenya. It is a 7 x 6 millimeter semitransparent oval with a nice eye and a great base color. The golden-brown stone on the right was also cut from material mined in Kenya. It is a 9 x 7 millimeter translucent oval. Many types of gems exhibit chatoyance; however, it is not present in every specimen of those gems and is usually only seen in a minority of specimens. Gems with well-known chatoyance include the following: chrysoberyl, tiger’s-eye, actinolite, apatite, beryl (aquamarine, heliodor, emerald), beryllonite, cerussite, danburite, diaspore, diopside, enstatite, garnet, iolite, kyanite, moonstone, opal, peridot, pezzottaite, prehnite, quartz, rutile, sillimanite, scapolite, spinel, topaz, tourmaline, and zircon. 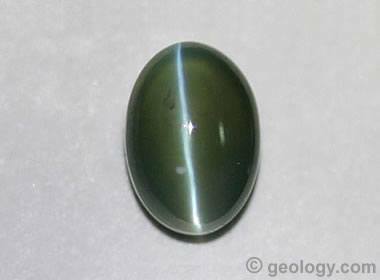 Cat's-Eye Sillimanite: This cabochon is an 11 x 8 millimeter oval cut from a purplish brown sillimanite mined in Madagascar. It has a distinct pink eye on a background that is nearly opaque. Some gems with a highly developed chatoyance can appear to be made of two different materials when illuminated from the proper direction with respect to the observer's eye. In these stones, the cat’s-eye will appear to divide the stone into a zone of light-colored material on one side of the eye and dark-colored material on the other. This phenomenon is known as the "milk-and-honey" effect. 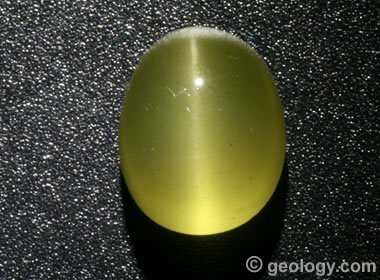 A photo of cat's-eye chrysoberyl showing the milk-and-honey effect is included below. 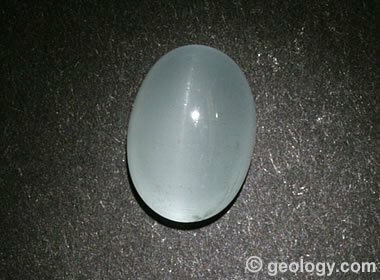 Cat's-Eye Aquamarine: Rare translucent aquamarines are known to produce cat's-eyes, although the eyes are generally not very strong. This greenish blue stone is about 11 x 8 millimeters in size and was cut from material mined in Madagascar. Milk-and-Honey Chrysoberyl: Chrysoberyl is the gem that exhibits the finest cat's-eye. 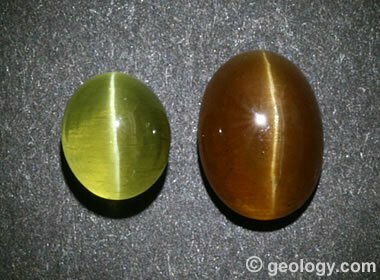 When the term "cat's-eye" is used without a mineral name as a modifier, the speaker is most likely referring to chrysoberyl. This specimen exhibits the "milk-and-honey" effect - when properly oriented, the stone has two apparently different colors on each side of the cat's-eye line. This green cat's-eye chrysoberyl was produced in Sri Lanka and is about 5.6 x 4 millimeters in size. The stone in this photo is the same stone shown in the photo at the top of the page. Cat's-Eye Heliodor: This golden-yellow heliodor beryl was mined in Madagascar and cut into a 10 x 8 millimeter oval. It has a beautiful translucent color and a faint eye. 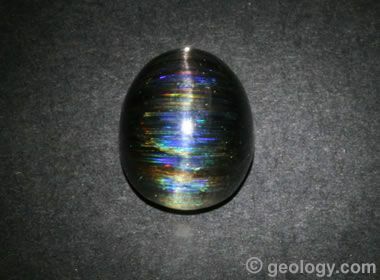 Anyone who cuts cabochons with the intent of producing a cat's-eye stone must first find a material with a silk of inclusions that is capable of producing an eye. Then the cutter must examine the rough and orient the stone so that the silk will be parallel to the bottom of the stone within the finished cabochon, and the parallel inclusions will be parallel to the long axis of the cabochon. If this proper orientation is not achieved, the stone will have an off-center eye or no eye at all. 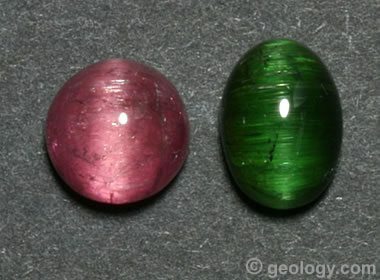 Cat's-Eye Tourmaline: Tourmaline often contains a silk of coarse tubes that can produce a very strong cat's-eye. In these stones you can see how the silk crosses the stone at right angles to the cat's-eye. A skilled cutter must assess the stone before cutting so that this orientation can be achieved. These colorful cabochons were cut from material mined in Brazil. The pink stone is an 8.5 millimeter round, and the green stone is a 10 x 7 millimeter oval. If a stone features all of the above criteria and has an exceptional body color, then you have a fantastic cat's-eye gem. The importance of a desirable body color cannot be overstated. 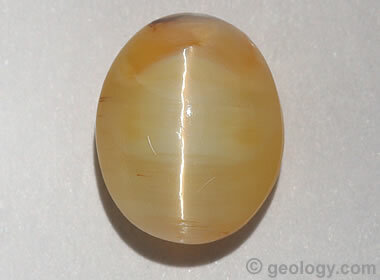 Cat's-Eye Scapolite: This scapolite cabochon, cut from material mined in India, is especially interesting. It contains a very coarse silk that not only produces a cat's-eye, but also serves as a diffraction grating that produces a strong display of spectral colors. The stone is a 12 x 9 millimeter oval. Cat's-Eye Opal: This yellow-orange cat's-eye opal was cut from rough mined in Madagascar. It measures 13.6 x 11.3 x 6.9 millimeters in size and weighs 5.98 carats. If you look closely, you might be able to perceive that the parallel mineral fibers cross the line of the eye at a right angle. This opal has not received any treatment. If you like cat's-eye gems and want to shop for them, they are very easy to find on websites and in stores that specialize in loose gems. The customers who shop at these stores are usually jewelry designers and gemstone collectors. Cat's-eye gems are rarely seen in the mass-production jewelry typically sold in department stores and shopping mall jewelry stores. Why? Because every cat's-eye stone is cut from a piece of rough that must be studied and oriented properly before cutting. After that work, the cutter almost always tries to fashion a stone that will produce the largest gem possible. 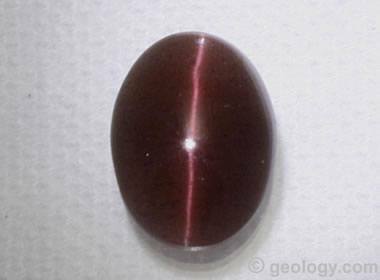 As a result, cat's-eye gems are rarely produced in the calibrated sizes needed for mass-production jewelry shops. 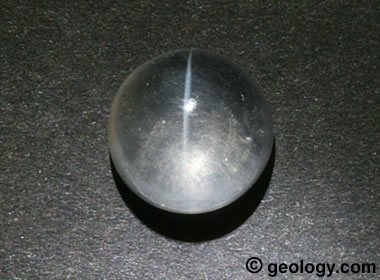 Cat's-Eye Quartz: This is an example of a clear quartz cabochon with a faint cat's-eye. This stone was mined and polished in India, weighs four carats and is about ten millimeters in diameter. The only cat's-eye gem that is commonly seen in mass-production jewelry is tiger's-eye. It is popular in men's rings and cufflinks and is also very popular in beads. Chrysoberyl is occasionally seen in jewelry stores, but it is very expensive in sizes that are large enough to be used in a ring. If you are looking for a piece of jewelry with a nice cat's-eye gem, the best place to shop is at the website or store of a jewelry designer. They are the artists who most appreciate these phenomenal gems and enjoy creating a special piece of jewelry to display a unique gem. Some jewelry designers have an inventory of cat's-eye gems or will help you shop for a gem that suits your color preference, size, and price range. They will then create a special piece of jewelry just for you. Black Star Sapphire: A black star sapphire 8 mm x 6 mm cabochon from Thailand. Inclusions within the stone align with the crystallographic axis to produce a six-ray silvery star. When the star is clearly visible and centered, as in this example, the base of the stone intersects the c-axis of the corundum crystal at 90 degrees. This stone has been heat treated to darken the stone and enhance the visibility of the star. Asterism is a type of chatoyancy in which the viewer sees the intersection of multiple cat's-eyes, or a "star," rather than a single cat's-eye. Tightly packed, parallel inclusions that are oriented in two different directions will cause a star with four rays. If there are three sets of inclusions, the viewer will see a star with six rays. The most well-known examples of asterism in gemstones are star ruby and star sapphire. 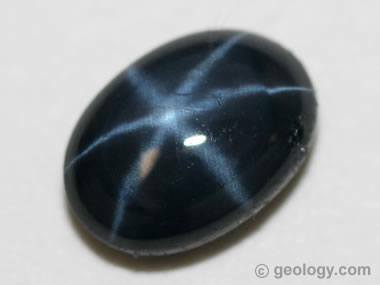 The accompanying photo shows a black sapphire with a six-rayed star. Stars can also be found in other gems such as garnet, spinel, diopside, and quartz.